Recipe courtesy of Ristorante Ragazzi. Take a large saucepan and place on medium heat. Add 2 tablespoons of olive oil, then add the onion and carrots and sauté for 2-3 minutes. Next, add the garlic, cook for 30 seconds, then add the rest of the vegetables. Cook for about a further 4 minutes. Season with salt and pepper. Bring a large pot of water to the boil (you will need about 1 liter for every 100 grams of pasta) and add a pinch of salt. Once the water reaches a rolling boil add the pasta and cook until it is al dente. Drain the pasta and add to the vegetable mixture. Toss the pasta and then serve immediately. 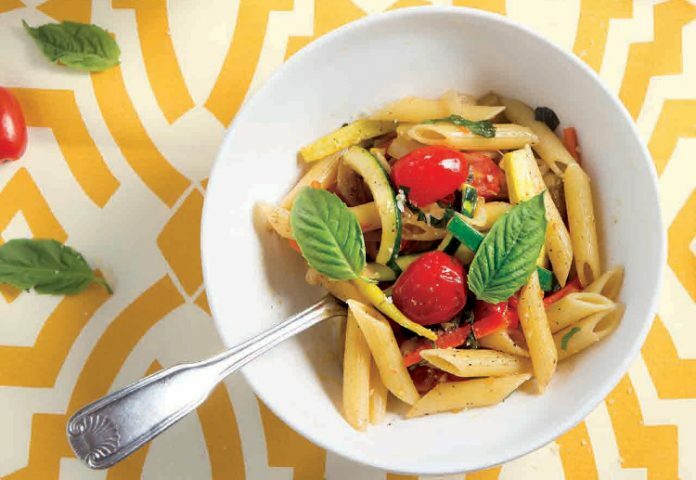 Finish with a drizzle of olive oil and some freshly chopped basil.